Brittany, a land of caracter, legends, and landscapes : Armor and Argoat. 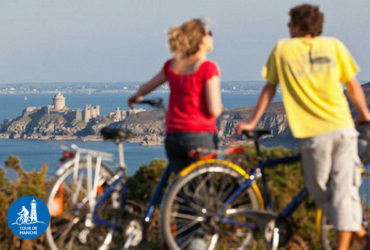 Best known for its myths and legends, Brittany is also very popular for cycling. It has knows its fair share of cycling legends! Jean Robic, Louison Bobet, Bernard Hinault, the Breton are the most titled French cyclists of the Tour de France. Hundreds of races and cycling events are organized each year and fill the pages of local and regional press. 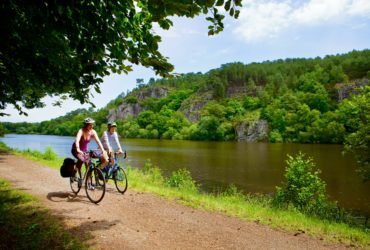 With over 1500 km of cycling routes this is a fabulous area we invite all cyclists to discover! In Brittany, explore a land of myths and legends and meet people proud of their roots and territory. Bretons have at heart to make you discover their heritage. 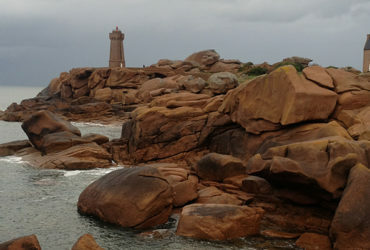 Brittany can be described as the “Pen-Ar-Bed”, which means the end of the world in Breton. It also points to the world beyond the ocean. Brittany is a land of travelers and exchange. 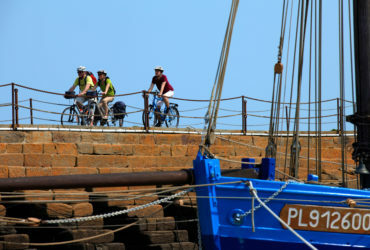 Sailors and adventurers left from the ports of Lorient, Brest, Paimpol, Saint Malo to discover the world and famous seas. They brought back rare goods such as fish, cocoa, coffee and sugar. Brittany became a gateway for these products to the rest of the country. Travelers and proud of their identity, Breton people still offer today one of the most important regional diasporas in the world. 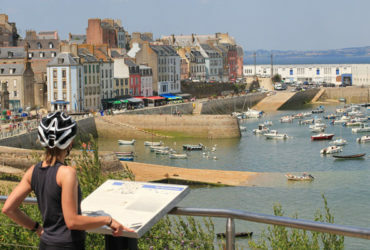 Brittany regularly welcomes many travelers who fall in love with the region and eventually settle there. 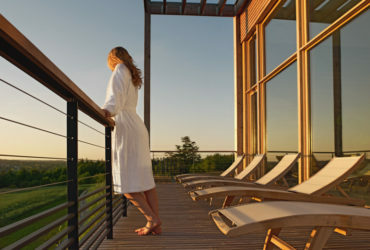 The warm and welcoming people, quality of the food, beauty and strength of natural elements are some of the reasons people choose to stay here. 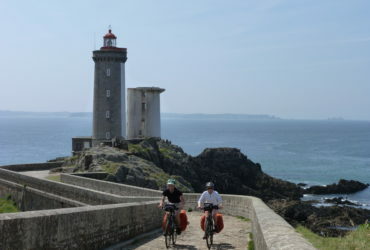 With one of the densest secondary road network in the country, Brittany is also a great cycling land. It allows you to ride easily on small roads, away from traffic. Just open up a map of Brittany to get an idea of all the possibilities. The number of intersections is impressive and cyclists need to be vigilant. 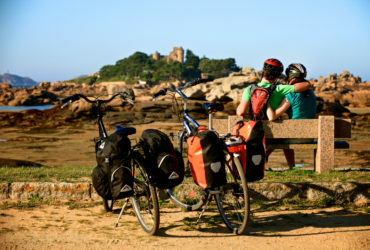 This is why Abicyclette®, a bike travel agency from Brittany, chose early on to include the loan of a GPS on all cycling trips and was one of the first to do it. It is a very much appreciated comfort to not have to figure out which way to at each intersection! 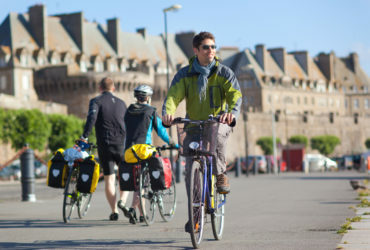 Brittany massively developed its cycling by densifying the bike road network and developing greenways. It offers a second life to impressive 19th and early 20th century infrastructures. Old railways, bridges, viaduct, tunnels are converted for lovely rides and reveal a bucolic Brittany. Coastal roads benefited similar enhancements. Cycling along the Coast you will find many small roads to ride along the cliffs. 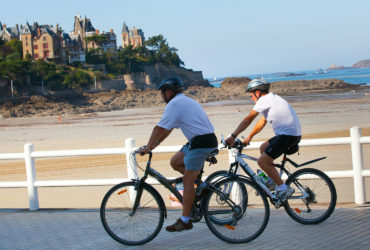 The recent development of international routes like the “Tour de Manche” or “Vélodyssée” on the seaside offer easy and accessible trips. 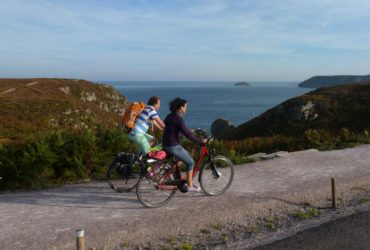 In the Finistère, the coastal road and the “solar wind road” (route du vent solaire) are both rich and enjoyable bike roads. 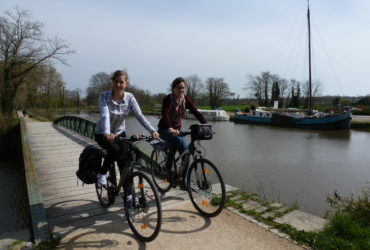 Greenways and canal pathways like the “Nantes to Brest canal” and “Canal Ile et Rance” are other great cycling routes. They rehabilitate towpaths which have lost their economic vocation. 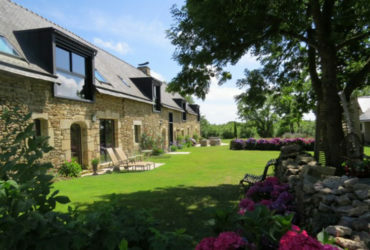 In Brittany, it never gets too hot and rarely very cold. It’s a nice mild temperature throughout the year, well suited for cycling! Chances are you will have more moderate showers than heavy rains. It usually drizzles very fine water droplets coming from the Atlantic or the English Channel. You rarely get soaked. If the rate of sunshine is below average, Brittany commonly enjoys several weeks of blue sky. Even with a light rain, the sun is never far away and makes several appearances daily, particularly on the coast where the wind clears the clouds faster. 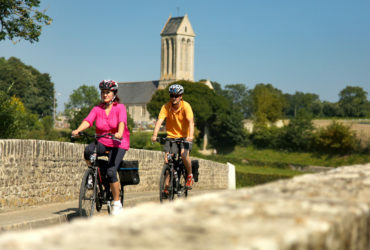 Gardens and countryside are green, and offer a fresh and bucolic landscape pleasant to cycle in. Roads, beaches, trails and restaurants are lively but never saturated! So do you need to bring a raincoat when coming to Brittany? Yes! Will you wear it? Only some of the time. And bring along sunscreen lotion, as sunburns are common among our travelers who aren’t careful enough! Rennes: Brittany’s administrative and former political capital, it is home to Brittany’s Parliament. The town center has charming cobbled streets and half-timbered houses. You can enjoy a walk in the magnificent Thabor garden and along the Vilaine canal. 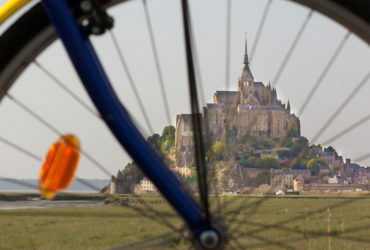 The Emerald Coast, the Rance Valley and the Bay of Mont Saint-Michel: From Cap Fréhel to Dinan and from Dinard to the Mont Saint-Michel, a unique color radiates from this land, soon to be protected by a Regional Park. The Pink Granite Coast: From Paimpol to Lannion, check out an amazing geological site in Perros-Guirec on the famous coastal footpath “Sentier des Douaniers”, also called the GR34. The villages are adorned with pink granite stone, a unique site in Brittany! The Monts d’Arrée: incredible mountain scenery in the heart of Brittany, 390 meters above sea level. A delightful playground in the wilderness for mountain bikers and confirmed cyclists! The Abers country and Ouessant Island: At Penn-ar-Bed, you will feel you have reached the end of the world facing the elements, with a rugged coastline and a strong character! The Crozon peninsula, the Bays of Douarnenez and Raz: Behold the most impressive cliffs in Brittany! 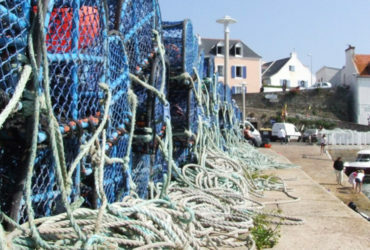 Quimper and South Cornouailles: Enjoy the beautiful beaches of Bénodet and Concarneau. Wander through Concarneau and Quimper, cities of art and history. 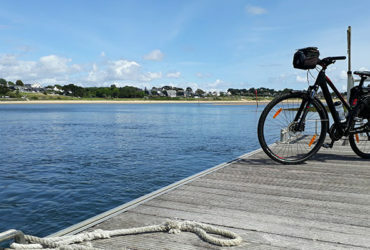 The Gulf of Morbihan: A fragmented landscape where the boat is a cyclist’s best ally to discover all the islands and peninsulas. 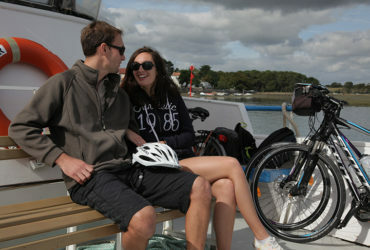 Southern Brittany enjoys a very mild appreciated climate! 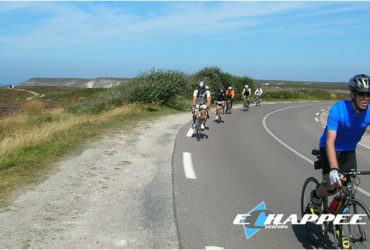 Between land and sea you cycle on small roads and pathways in Vannes or Belle-île en Mer.